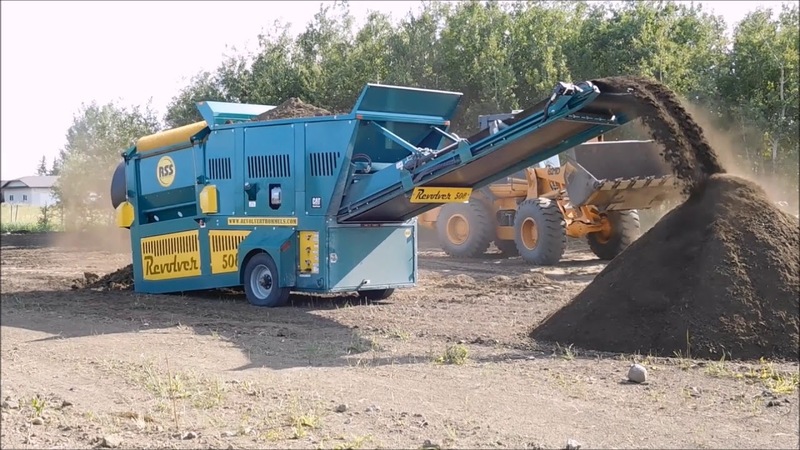 Revolver Screening Systems is the manufacturer and worldwide distributor of the portable trommel screening plant known as the “Revolver RT508”. A wealth of experience in the industry and many years spent working with contractors and listening to their needs, has led to this state of the art screening system. Very portable with a fast set up time the Revolver RT508 has been described by its owners as a compact, cost effective user friendly plant with bigger machine features. A 5′ diameter reversible drum, the biggest in its size class, a 36″ variable speed feeder, the widest in its size class, a 12,000 lb. certified, highway axle, a one section screen for durability, are just a few of the specifications they refer to. The optional extra equipment, the choices of engine size plus the available hydraulically powered Revolver stackers, all add to a versatile and very efficient materials processing package. The RT508 is a machine that has been designed and built in North America to exceed the heavy duty North American standards our industry demands and is supported by an ever expanding sales and service dealer network. We have taken the greatest care to manufacture a safe and reliable portable trommel screening plant that combines productivity with versatility and offers a very low cost per yard, no matter what the material. The Revolver RT508 is, without doubt, “an innovation in portable trommel screen technology”. RT508 with optional overs conveyor, processing topsoil in Marshfield, Missouri. RT508 with two CHR4030 stackers, single pass topsoil production near Minden, Ontario Canada. High production - low cost per yard. The Revolver RT508 is the highest production plant of its size in the industry. Its 5′ diameter x 8′ long variable speed and reversible drum, 36″ variable speed feeder and high horsepower Kubota or Caterpillar diesel engines all allow for a low cost, highly efficient plant capable of 70 to 125 cubic yards per hour in a “one man” operation. Skid steers, tractor backhoes, wheel loaders with up to 9 ft. wide buckets or hydraulic excavators, the RT508 accommodates them all. Quick, easy & efficient mobilization. Easily transported using a one ton pickup truck, the Revolver RT508 offers quick and easy mobilisation and set up times, all necessary requirements for today’s contractors. A 12,000 lb. highway axle with electric brakes, the hydraulic folding fines conveyor, hydraulic landing gear, an LED lighting package and adjustable pintle hitch, all give the Revolver RT508 the street portability needed by landscaping companies and topsoil producers of any size. User friendly, versatile and productive. The “quick change” drum system allows for fast and easy drum removal to be replaced by another with a different screen size, adding to the versatility of the plant. The brush screen cleaning system with ground level adjustment, removes the headache of screens plugging and the slowing of production. Minimal material re-handling and the effective separation of reject material from re-saleable product means more production with less cost. Get in touch with us today to learn more about our products and services. 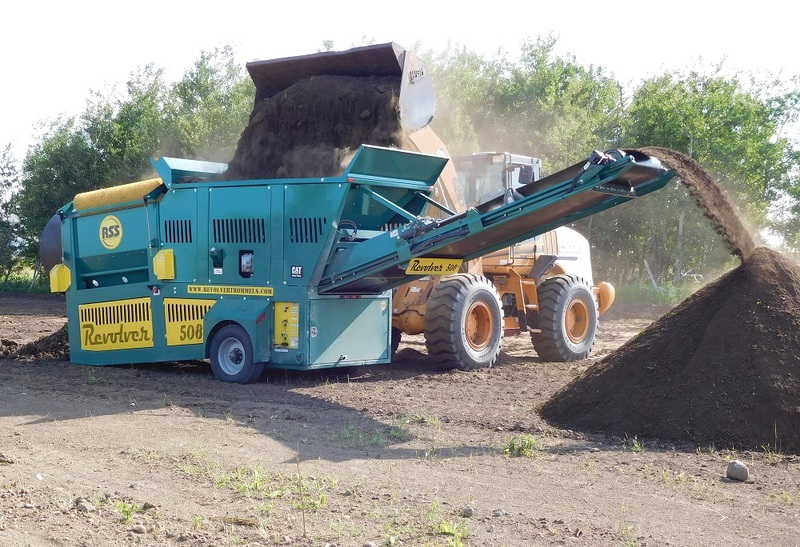 Revolver Screening Systems is the manufacturer and worldwide distributor of the portable trommel screening plant known as the “Revolver RT508”. A wealth of experience in the industry and many years spent working with contractors and listening to their needs, has led to this state of the art screening system.